Chat wala’s wud not be adding dates as it wud just shoot up their cost and it will not be economical. But for people doing at home.. Chat is definitely healthy.. for its got this iron packed chutney..
Deseed the Dates . (I have used seedless Dates in this preparation. )Remove any seed and clean the tamarind and keep it aside. Combine all the 3 essential Ingredients in a pan along with red chilli and add enough water to dissolve it ..Allow this combination to boil for 15 minutes and let it cool down. Store them in small containers and leave them in deep freezer. Use it anytime in the next few months.. It is bound to stay fresh. aussome. i never knew abt dates chutney. coming online after a long time and love your new template/avatar. This is an essential thing for me too for my chaats. Even I add a bit of rock salt to mine. 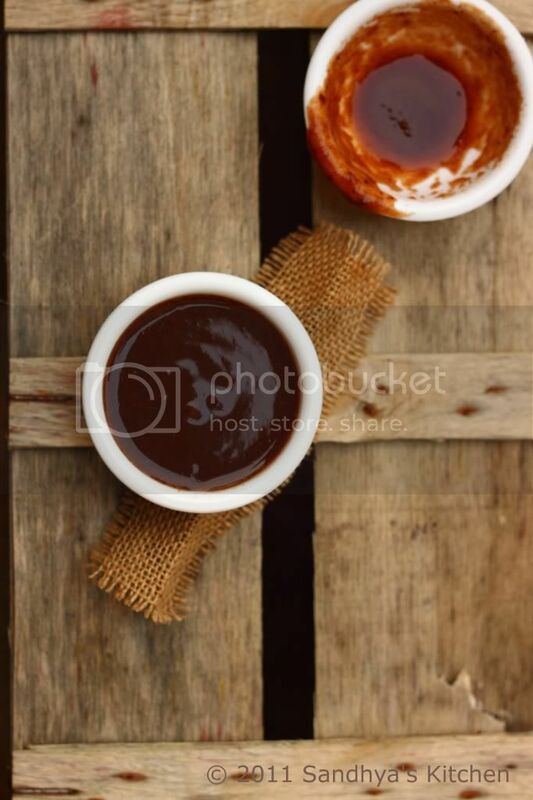 oh gal, that looks really yummy..A must try..
yum yum Dates chutney with a nice click. Yummy and simple to make chutney. I have never attempted to make this, inspite of the abundance of dates available here. Should try this soon. Nice click,I love the tanginess and dates combo ! I love date chutney particularly with jagerry. Thanks for sharing. Awesome. My sister in law makes date chutney in a different way. She adds half a portion of dates, raisins, a pinch of chilli powder, vinegar and salt. Once its ground well in a blender, it can be served with biriyani and it tastes very yummy too. Your recipe also seems very tasty and easy to make, thanks for sharing. never heard of dates chutney…looks so delicious and tempting…must have tasted perfect! 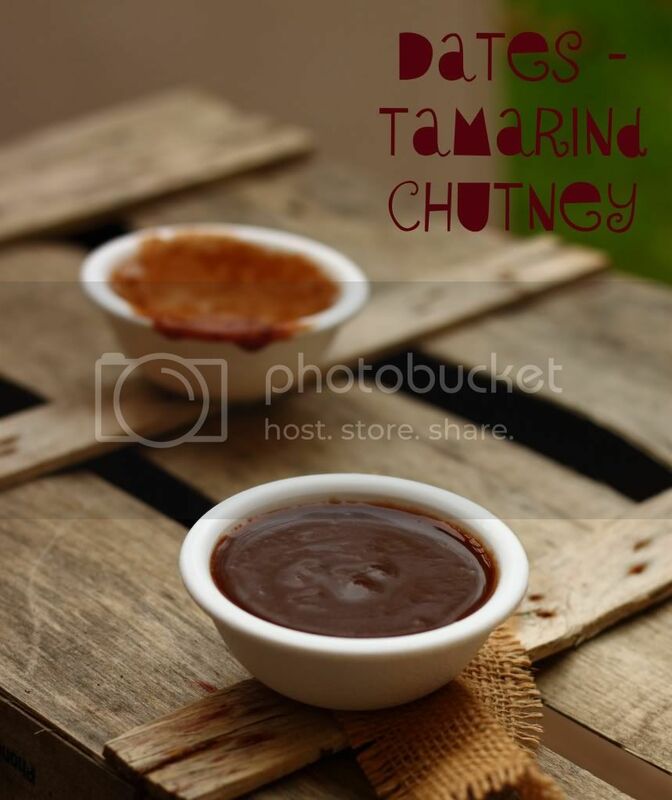 never heard of this chutney….must have tasted perfect!…looks yummy, dear! Tempting dates chutney, prefect for chaats items.. WOW!! !Yummy..They looks so lovely. Feel like having some. Thanks for this lovely and new recipe. Dates chutney looks delicious and tempting. Nice click..I can't imagine any chaat wid out this chutney..
Looks tangy and versatile Sandhya. Would love to try this. wow..what a beautiful color…so yummy and great dear. Hi got to you via foodgawker! We are a new community driven food blog – we would love to see some posts by you! Check up out at feedintothefeed.com and consider submitting your work!